BIOGRAPHY Drummer Gene Fourton's powerful technique and supportive musical approach have inspired collaborations with the legendary Lionel Hampton and his Orchestra, R & B singer Esther Phillips, which was an ensemble that was directed by saxophonist Pee Wee Ellis formally of James Brown; in addition, with dancer and choreographer Bob Fosse, trumpeter Clark Terry, and saxophonist Stan Getz among many others. Born in Westchester County, New York, and raised in suburban Connecticut, Fourton started to play drums at age 14 after studying piano, viola and clarinet for 5 years. His mentors included Elvin Jones, Tony Williams, Joe Morello, Freddie Waits, Joe LaBarbara, Steve Jordan, Terry Silverlight, Sonny Igoe, David Friedman, David Samuels, Alexander Lepak, and Rosa Antonelli. A consummate timekeeper combined with a powerful sensitive technique and tasteful musical approach, Fourton has performed internationally with the legendary Lionel Hampton and his Orchestra along with conductor Arthur Fiedler and the Boston Pops Symphony Orchestra with organist "Wild" Bill Davis, which was for a PBS show on Channel Thirteen, and on the Today and Tonight Shows with Lionel Hampton on numerous occasions. Fourton was also the drummer for the dancer/choreograher Bob Fosse's Broadway show Dancin'; he has also played and recorded as a percussionist the music of composer Aaron Copeland with Aaron Copeland. Another important performence that should be noted is that in the R&B world Fourton also played with drummer's Steve Gadd and Chris Parker's band, known as Stuff, at Mikel's in New York. At the time, Mikel's was a center for studio musicians to perform nightly, and on that particular night, Eric Clapton, Ron Wood of the Rolling Stones, and many other musicians were in the audience who performed with Fourton with this dynamic ensemble of studio musicians. This amazing CD offers compelling cosmopolitan grooves, instantly appealing hooks, and funky rhythm tracks. After 2 years of blood, sweat and tears, it's finally done. Fourton/Norkin/Torres have created a fusion of music that generally falls somewhere between post-bop, funk edged jazz, and R & B grandeur that is unlike any music you've ever heard that features dynamic rhythm section performances with guest appearances by pianist Uli Geissendoerfer and guitarist Jack Wilkins. The brainchild of drummer Fourton, this triumverate strikes a bold accord on four well-chosen standards and eight originals by principal composer Norkin, a 1970's graduate of the Berklee College of Music. Drummer Gene Fourton's powerful technique and supportive musical approach have inspired collaborations with the legendary Lionel Hampton and his Orchestra, R & B singer Esther Phillips, which was an ensemble that was directed by saxophonist Pee Wee Ellis formally of James Brown; in addition, with dancer and choreographer Bob Fosse, trumpeter Clark Terry, and saxophonist Stan Getz among many others. Born in Westchester County, New York, and raised in suburban Connecticut, Fourton started to play drums at age 14 after studying piano, viola and clarinet for 5 years. His mentors included Elvin Jones, Tony Williams, Joe Morello, Freddie Waits, Joe LaBarbara, Steve Jordan, Terry Silverlight, Sonny Igoe, David Friedman, David Samuels, Alexander Lepak, and Rosa Antonelli. 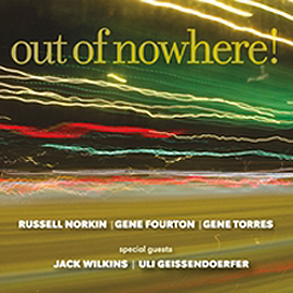 On this new CD, Out of Nowhere!, Gene Fourton produced this artistic work and he strikes a bold accord on four well-chosen standards, namely Moment's Notice; Now He Sings, Now He Sobs; Out of Nowhere; and There is No Greater Love along with eight originals by principal composer and guitarist Russell Norkin, a 1970's graduate of the Berklee College of Music. As for Fourton, a longtime professional with a wealth of road experience, he is also a producer and songwriter. With numerable credits on Broadway, television, and the New York jingle scene, Out of Nowhere! marks a unique recording project produced by Fourton. Out of Nowhere! is sparked by Uli Geissendoerfer's dazzling keyboard skills, along with Norkin's warm dynamic guitar tones, Gene Torres' brilliant bass playing along with Jack Wilkins' masterful guitar work. Gene Torres at any given day, can be playing bass in genres from Hip-Hop to Bebop, with a little rock thrown in. Now not only playing bass, but writing, producing, music editing, music notation (Finale), teaching privately and in a school. Some of the people Gene has had the pleasure of playing and or recording with runs the gamut of music styles, for example: Ben E. King, Public Enemy, Yousef Lateef, Chico O'Farrel's Afro-Cuban Big band at Birdland. Pianist Uli Guissendoerfer has played and/or recorded with Slide Hampton, Vince Cherico, Luis Bonilla, Gregory Jones, Mario Rodriguez, Harvie S(wartz), Omar Kabir, Eddie Allen, Ari Hoenig, Mark Walker, John Benitez, Tito Puente, The Big Apple Circus, Mario Rivera, Blood Sweat & Tears, Leslie Uggams, Cirque du Soleil, Ute Lemper, Peter Brainin, Nicki Marero, Luis Quintero, Richard Bona, Jay Rodriguez, ... the list goes on. It is truly amazing how many truly gifted musicians arrive literally every month. In 1996 he had the chance to jump in for Rebecca Mauleon and become a teacher and workshop leader at the Afrocubanismo! '96 in Banff, Alberta, Canada, together with Chucho Valdés. In 2001/2 he did together with Steve Sandberg the music to the short film "Climbing Miss Sophie", and it was the winner of the NYU film festival 2002 and consequently shown around the world from Cannes to the Sundance Film Festival , receiving critical acclaim. A consummate accompanist, Wilkins has played and recorded with renowned singers Mel Torme, Ray Charles, Morgana King, Sarah Vaughan, Sammy Davis Jr, Tony Bennett, Manhattan Transfer, Nancy Marano, Chris Conner, Cassandra Wilson, and Jay Clayton. Wilkins was awarded an NEA grant in recognition of his work and contribution to the guitar. He has been widely and prominently profiled in such publications as Guitar Player, Just Jazz Guitar, Downbeat, 20th Century Guitar and Leonard Feather’s Jazz Encyclopedia. Jack was invited to the Smithsonian Institution as part of the Blue Guitars exhibit, and appeared on the P.S. I. first live jazz Internet concert. He was also featured on the J.V.C. festival tributes to Johnny Smith, Tal Farlow, Herb Ellis, and Barney Kessel.